Northampton bowler Jamie Walker has been named in the England team for next month’s Test match against Australia at Royal Leamington Spa. The Test will take place on July 1 and 2 at Victoria Park in Leamington, and Walker is in the men’s team which also consists of Andrew Knapper (Berkshire), Ian Lesley (Devon), Steve Mitchinson (Essex) and Mark Read (Cornwall). The Test will be in a ‘top club’ format which will offer the ability for both countries to interchange all players from discipline to discipline and into varying positions. Another Northants bowler has also been named in the England Development team for their Test against the Aussies. Connor Cinato has received the call-up for the match, which will be staged at Whitnash Sports and Social Club in Whitnash, Warwickshire, on Saturday, June 30. Cinato’s team-mates are Ryan Atkins (Herefordshire), Marcus Clifton (Leicestershire), Edward Elmore (Huntingdonshire) and Harry Goodwin (Devon). This too will be played in a ‘top club’ format. NORTHANTS Ladies thrashed Bedfordshire 152-85 in the first match of their national Johns Trophy campaign at Wellingborough BC. The County had five winning rinks, with the highest scoring rink the one skipped by Tina Broderick, which posted a 23 shots win. Not far behind were those skipped by Rebecca Wigfield and Di Brumwell, which secured 20 and 18 shots victories respectively. NORTHANTS Men secured a 130-118 win against Hertfordshire in the Middleton Cup - despite losing four and drawing one of the six rinks played at Kingsthorpe BC. Vernon Gearey’s rink proved to be the heroes as their 25-shot victory proved to be the match-winning one for Northants. Until the last few ends of play it looked as though the County might have a couple more rinks winning, but it was not to be. Northants claimed 13 points for their win, with Hertfordshire taking nine. After the match, Middleton Cup blazer flashes were presented to Mick Spear (Kingsthorpe BC), Shaun Marriott, (Northampton West End BC) and Chris Gray (Burton Latimer Town BC) for making their debuts in the competition. 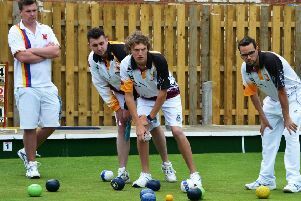 NORTHANTS Men travelled to Bilton BC in Rugby to play a match on the 75th Anniversary of the Rugby Bowling Association. The County secured a big 135-84 win, and had just one losing rink and that by only one shot. The highest scoring rink for Northants was the one skipped by Brian Jones which posted a 23 shots win. The County was pleased to record the first outing with the presentation of a ‘Colt’ badge to two players from Abington BC, Alan Mann and Alan Johnson. THE following players have been selected to represent Northants Men in a friendly against the Cavaliers BA at Wellingborough BC next Wednesday (2pm). NORTHANTS Vice-Presidents enjoyed a 143-107 win against The Imps BA in a friendly at Kislingbury BC. The VPs had four winning rinks and two losing, and the highest scoring rink was the one skipped by Jack Brown which posted a 22 shots victory, but not far behind was that skipped by Richard Dyball which won by just two shots fewer. NORTHANTS Ladies were handsome 139-88 winners in their friendly against Worcestershire at Gilt Edge BC in Kidderminster. The County won four, drew one and lost one of the six rinks, with the highest scoring rink the one skipped by Brenda Bishop, which recorded a 19 shots win. Not far behind were the rinks of Emma Exley and Liz Keeney, which won by 16 shots and 14 shots respectively. TEAM boss Phil Reeve has named his team for Northants’ next Middleton Cup clash, against Suffolk at Bramford BC in Ipswich on Saturday (2pm). The team shows just two changes from the win over Hertfordshire, with Callum Height, who was not available for that game, coming into Darren Childs’ rink in place of John Haines and Richard Lemon coming into Paul Broderick’s rink in place of Connor Cinato. NORTHANTS Men have selected the following players for their Balcomb Trophy clash against Leicestershire at New Lount BC in Coleorton on Sunday morning (10am). LATEST results from county competitions. The quarter-finals and semi-finals will be played at Kingsthorpe BC on Sunday, June 10.